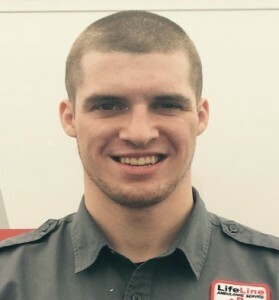 Christopher Grant is an EMT at LifeLine Ambulance Service. He started his EMS career in 2015 after becoming a Navy Corpsman. Chris has a very positive demeanor and is liked and admired by his peers. He serves as a preceptor for new EMTs and shares his military training and experiences with them; in turn they are better prepared to meet the daily challenges and provide excellent patient care. His professionalism and energy are admired by all those who work with him as well as the patients he cares for. We are proud of his continued service to the United States Navy and are grateful for his dedication and leadership at LifeLine Ambulance Service.